UK: Titan Books, 2013, HB. Order it from: Amazon.co.uk or Amazon.com, or or buy the audio book at Audible.com. Fallen from grace and driven from the British Empire in previous instalments, Dracula seems long gone. A relic of the past. Yet, when vampire boy Johnny Alucard descends upon America, stalking the streets of New York and Hollywood, haunting the lives of the rich and famous, from Sid and Nancy to Andy Warhol, Orson Welles, and Francis Ford Coppola, sinking his fangs ever deeper into the zeitgeist of 1980s America, it seems the past might not be dead after all. His old life – even from moment to moment with the partisans, he’d had a mortal life – was shredded away. His dead man’s clothes ripped on flints. He lay in a tangle in the dark. Now he could see the stars, even through thick clouds. Above, he was Dracula, arms proudly folded. UK: Titan Books, 2012, PB. Order it from: Amazon.co.uk or Amazon.com, or buy the audio book at Audible.com. A brand-new edition, with an additional novella, in the critically acclaimed, bestselling series, Anno Dracula. The Vampire spy stood on the balcony and lit a cigarette with a Ronson lighter, flame reddening his forceful face. He exhaled smoke and looked down on Beauregard. His quizzical smile exposed a prominent fang. 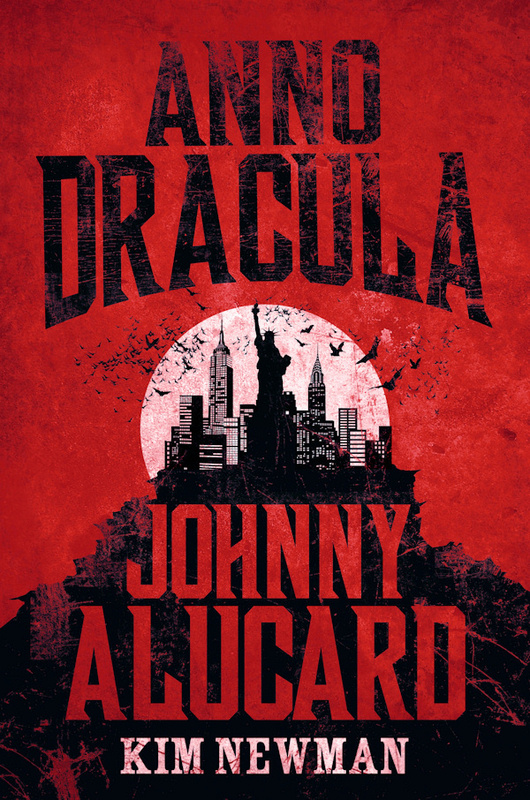 A brand-new edition, with an additional novella, of the critically acclaimed, bestselling sequel to Anno Dracula. The Graf von Dracula was the Elder Vampire of Europe, Master Strategist and Great Visionary, Architect of Victory and Defender of the Kind. It was due solely to his colossal schemes that the vampire condition was spread throughout the world. Uncle-by-marriage to Kaiser Wilhelm II, he was rumoured to have a greater say in the conduct of the war than Hindenburg or Ludendorff. UK: Titan Books, 2011, PB. It’s 1888 and Queen Victoria has remarried, taking as her new consort Vlad Tepes, the Wallachian Prince infamously known as Count Dracula. Peppered with familiar characters from Victorian history and fiction, the novel tells the story of vampire Geneviève Dieudonné and Charles Beauregard of the Diogenes Club as they strive to solve the mystery of the Ripper murders. Anno Dracula is a rich and panoramic tale, combining horror, politics, mystery and romance to create a unique and compelling alternate history. Order the Hardback from Amazon.co.uk, or the paperback from Amazon.co.uk. It’s the same book published as Judgment of Tears in the USA a year and a half previously, except with a nifty new cover. “. His blood sang inside her. “I love you forever,” he whispered, too soft for the others to hear. For you collectors out there, this is a special limited edition of “Andy Warhol’s Dracula”. 125 numbered hardback copies were issued, and 500 numbered paperback copies. The introduction is written by F. Paul Wilson. Contact PS Publishing, 98 High Ash Drive, Leeds LS17 8RE, England. The third in the popular Anno Dracula series. Scooters, spys, a serial killer and a great soundtrack! “They say the waiters here are très delicious,” Geneviève said, peering into the empty, shadowed bar. Geneviève looked, almost admiring, at her. Order it from Amazon.co.uk or Amazon.com. This book is a loose sequel to Anno Dracula, and is set against the backdrop of World War I. An alternate reality Horror novel in which Dracula survives his tangles with Van Helsing and returns to London to seek his revenge: by marrying Queen Victoria and turning a large percentage of the English population into undead.